There has been some discussion recently about recommending AV consultants. It’s an especially tough type of recommendation because all projects’ scope, firm specialties and overall bandwidth are different and can change in weeks and sometimes days depending on multiple variables. Ultimately what you should be looking for is an overall stable firm with a good reputation and a specialty team, if needed for your project (acoustics for theaters and music halls, large venue focus for arenas, etc). It also helps if the consultant has a local office or at least a clause in the contract that they will be available and on campus when needed. Most institutions have a process for hiring a technology consultant including a thorough and multi-stage interview process, a portfolio review of prior projects of similar size and scope, and a cost analysis. But what happens when you come away from the process with what you think is a winning firm, until things start going sideways. 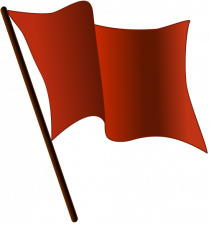 What are the signs that signal red flags for your consultant-client relationship? They start questioning or changing your established standards, without discussion.- Some experts (as you hope most consultants are) often think they are helping you by changing out specifications for gear and processes that they think may be more effective or efficient. But to do this without discussing it with you disrupts trust and may have you questioning their motives: Do they understand your needs and standards? Are they changing specifications to give an upper-hand to an installer? Will the modified specs result in a change order down the line? They aren’t visible on campus during close out/ commissioning.- This is when their reputation with you (and your network) is made or broken- why wouldn’t they be there? They should have oversight of the project from the moment they are brought in until the users are trained and the building is commissioned. This should be included in the contract and is something that most consultants will require because, well, it’s their reputation. They are clearly disrespectful or condescending toward you, your staff or your colleagues. – There is NO excuse for unprofessional behavior. From anyone. Period. Most AV consultants in the industry are trustworthy and qualified experts who excel at challenging technology systems design. If you have the luxury of choosing your AV consultant and you have your approval process firmly established, you likely won’t have a problem. As with all long term and successful relationships, consistent and open communication is key. And when in doubt, listen to your gut. YOU are the expert on your campus.